Prestigious wood laminate furniture makes a lasting impression with distinctive styling, contoured solid wood accents, waterfall-shaped edges and intelligent solutions. high-pressure laminate end panels and tops with hardwood trim are stain-resistant and abrasion-resistant. file drawers operate on full-extension steel ball-bearing suspensions and store letter-size or legal-size files (hangrails included). all 72" wide desks feature a conference overhang. full-height pedestal design maximizes storage space. 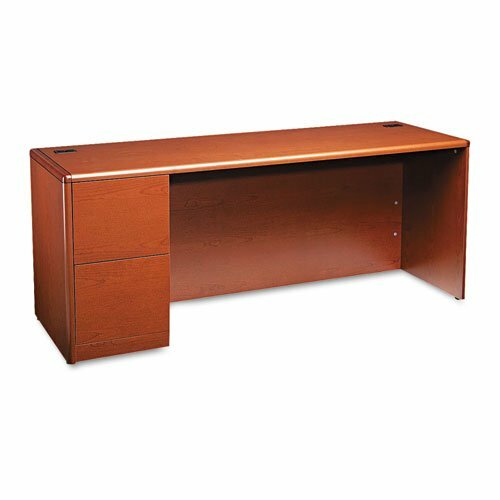 desks, credenzas, returns and lateral files feature interchangeable core-removable locks. desks, credenzas, return and bridges feature two cord grommets to route and hide wires and cables. bridges connect a single-pedestal desk or peninsula to a single-pedestal credenza. furniture is certified by scs to be in compliance with specific indoor air quality emissions requirements and meets or exceeds applicable ansi/bifma standards.